(Steve Griffin | The Salt Lake Tribune) Salt Lake Bees outfielder Eric Young Jr. warms up with his teammates at Smith's Ballpark in Salt Lake City Wednesday August 16, 2017. Eric Young Jr. touched home plate with three fingers extended, pointing to the sky. Young’s gesture that followed a go-ahead home run in his third game with the Los Angeles Angels after being recalled from the Salt Lake Bees in May remains the symbol of an unforgettable season for the veteran outfielder. He has thrived in the major leagues and Triple-A baseball, helping the Angels and Bees contend for playoff spots, while sharing a story he hopes will helps others. Eric Young III, nicknamed Trey, died hours after Victoria Young gave birth to him in Arizona in January, 11 weeks before the due date. The boy’s father has publicized the experience in an effort to move himself, his wife and others toward what he labels “a place of peace.” Trey’s life consisted of one day, officially, yet he will have a lasting effect. Young’s account has evoked responses from many people who have gone through their own heartbreaking ordeals. The responses have come from coast to coast and even in a letter written in broken English and sent from Japan. Young’s words hit home for Shane Robinson. A veteran outfielder who also has spent time at both levels this season, Robinson is a father of two daughters. Harper, who turns 3 in November, was born with a complicated stomach-esophagus condition that has required extensive treatment. And that’s why Robinson marvels about his friend’s ability to maintain strong faith and perform well on the field. 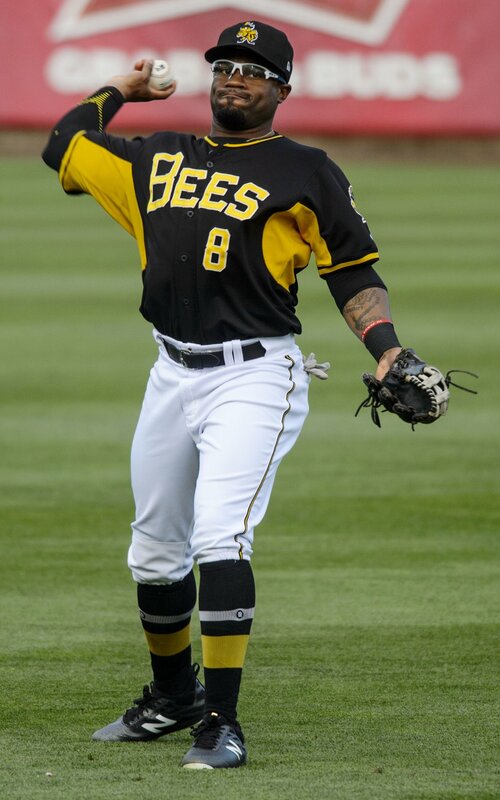 Young blasted Triple-A pitching in April and May, batting .354 for the Bees and becoming the Angels’ obvious replacement when Mike Trout injured his thumb. The call-up came during “one of those times we needed great news,” Young wrote in a FoxSports.com piece, detailing how Victoria met him in the parking lot of Smith’s Ballpark to share in the celebration. Young soon fulfilled Pastor Brenda Pratt’s words from Trey’s funeral service. She pictured Young homering for the Angels and honoring his own angel — and it happened vs. Atlanta in the eighth inning of a 2-1 win, as he hit his first big-league homer in three years. In an on-field interview afterward, Young’s tears flowed. “It was all coming out of me at that moment,” he said. Two weeks later, Young’s eighth-inning homer tied the game before his 11th-inning single beat the New York Yankees. He tailed off after that, but still hit .260 in 34 games before returning to the Bees when Trout was activated after the All-Star break. Young has cooled off in Triple-A, although he’s batting .307 for the PCL season. (Steve Griffin | The Salt Lake Tribune) Salt Lake Bees outfielder Eric Young Jr. follows through on a swing during game at Smith's Ballpark in Salt Lake City Wednesday August 16, 2017. The Bees’ regular season ends Sept. 4, three days after major league teams can expand their rosters. The Angels are in the American League wild-card chase, and Young would be valuable to them as a pinch-runner, among other roles. He would love to return to Anaheim and make the 2017 season even more memorable, after Trout’s absence failed to derail the Angels’ season. “I’d like to think that I helped,” Young said. Doctors have cleared the Youngs to conceive a child, when they’re emotionally ready. Trey remains irreplaceable. Yet having another baby someday may bring them closer to that place of peace. Major League experience • 597 games with five teams over nine seasons; .247 batting average. Father’s career • Eric Young Sr. played 1,730 games and batted .283 with eight teams over 15seasons, including a stint as an original member of the Colorado Rockies, Eric Jr.’s first team. Pennant races • The Salt Lake Bees (65-65) have a one-game lead over El Paso in the Pacific Southern Division with The Los Angeles Angels (65-61) entered Wednesday’s play a half-game behind Minnesota for the American League’s second wildcard. Still to come • The Bees open their final four-game series at home vs. Fresno on Sept. 1, the day major league teams can expand their rosters.